Unprecedented high-resolution data from undersea canyons off Vancouver Island's west coast is bringing new understanding of the importance of these canyons as rapid-transit corridors for carrying carbon from the ocean surface to the deep sea. An international study co-led by Ocean Networks Canada (ONC) staff scientist and University of Victoria biologist Fabio De Leo uses synchronized real-time data from "Wally" the deep-sea crawler and NASA's MODIS satellite for the first time to measure carbon transport from the sea surface to the deep ocean by wintertime ocean circulation, canyon rim eddies and downwelling – the sinking of dense, cold water beneath lighter, warmer water. Wintertime phytoplankton blooms observed by MODIS from outer space disappeared from surface waters off the west coast of the Island and reached Wally at 870 metres depth in Barkley Canyon within 12 to 72 hours. "Data from Wally and MODIS supports that these canyons play an important role in rapidly transferring carbon to the deep sea during winter," says De Leo. "This new understanding of canyon transport of organic matter, combined with improved carbon budget models, can help climate scientists better predict global warming scenarios." Understanding the fate of carbon sources around the world is critical for predicting the amount of global warming. De Leo and colleagues showed that in winter, sinking organic carbon - such as dead phytoplankton - is transported from the ocean surface to the deep sea and permanently sequestered in seafloor sediments. Up until now, carbon transfer during winter was presumed to be insignificant in the global carbon cycle compared to spring and summer. With some 9,500 submarine canyons around the world, "these carbon storage numbers add up and could be globally important for Earth's carbon budget as it relates to climate change," says De Leo. Wally is equipped with sensors that measure water currents, fluorescence and turbidity and is connected to ONC's cabled observatory. 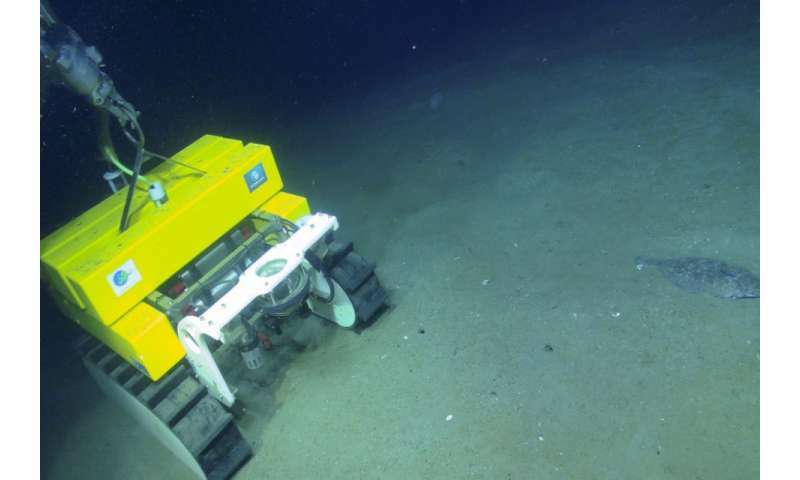 Remotely controlled via the worldwide web by a research team in Germany, the crawler has an onboard webcam providing detailed views of seafloor sediments and local marine life. NASA's MODIS satellite measures ocean surface dynamics and tracks changes over time from space. The study was co-authored by scientists and researchers from universities and institutes in Canada, Germany, Spain, Italy and the US, and published in Scientific Reports in September.